View the Updates and Video Blog pages for the latest. The ruling, which came last year, was part of a seven-year legal battle the Pearns waged against WLLA, which cost the couple thousands of dollars. In the fall of 2017, a lawyer for WLLA moved to withdraw the association’s appeal of the decision, and the judge accepted the withdrawal. That meant that his previous ruling stands—and that should have been the end of the matter. Amelia, who keeps a detailed website about the issue at www.shoholapa.com, declared victory. Then the bill came. Residents of Maple Park and Walker Lake turned out to a meeting of WLLA board on December 28, and the revelations continued. An updated Zavada report indicated that board members had not been paying their dues. The president of the board, Fran Orth, said she never got the bill for her dues, and thus she didn’t pay them; she then resigned. The updated Zevada report also showed that some $123,492.50 of association funds were withdrawn from 2012 to 2016, and no one knows who withdrew it or where it was spent. The report also detailed a number of irregularities, and the entire matter is now being investigated by Pike County District Attorney Raymond Tonkin and the Pennsylvania State Police. Representatives from WLLA have agreed to meet with these officials. The issue regarding fees for Maple Park residents seems to still be up in the air for the time being. According to Maple Park resident Allen Sherer, in 2013 the WLLA took ownership of the beach that Maple Park residents have a deeded right to use. The court ruled that WLLA can only charge Maple Park residents $10 per year, yet residents are getting bills for $375. WLLA would like to charge Maple Park residents a fee based on the actual costs of maintaining the beach, but they don’t currently have any idea what the actual costs are. Board members from WLLA did not respond to a request for comment. ​A financial audit has brought to light more than $123,000 of homeowner funds missing from a private community in Shohola. The findings have prompted State Police to dig deeper into the dealings of Walker Lakeshores Landowners Association. Pike County District Attorney Raymond Tonkin declined to comment on the investigation. He also would not confirm his office’s involvement. Calls to the association’s board of directors were directed to Farley, who currently serves as the association’s legal counsel. Farley did not return calls for comment. Independent auditor Zavada & Associates began reviewing the association’s books in September. The firm found more than $100,000 of unauthorized withdrawals and payments made from association accounts between 2014 and 2016, according to a Nov. 18 report by Ron Lisciandrello, the association’s current treasurer. Those expenses included payments for home utility services, dental and medical bills, and cash withdrawals. They also included the purchase of items like a gazebo and one or more bathtubs. An undetermined number of association members received discounts for paying lake maintenance fees in cash, the Zavada audit also found. Some of those transactions, for which there is little documentation, are now difficult or impossible to review. Walker Lakeshores has been operating in the red for some time, Lisciandrello also said in his Nov. 18 report. The association ran up a $56,000 debt during the past two years for hosting social events alone. Homeowners paid more than $15,000 interest on top of that during the same two-year period. Two loans in the association’s name total almost $150,000 altogether. It is unclear who authorized those loans, nor is it known what collateral was used to borrow against. As of Nov. 15, the association had just $104,000 in its checking account — $46,000 less than what it owed. Lisciandrello advised in his report that the association’s board of directors curtail all social expenditures until further notice. He also recommended a no-cash office policy going forward. The association is insured in the event of employee theft, according to homeowner notes from a later board meeting. That insurance policy, however, covers claims up to $30,000 only. Without legal action, homeowners may be on the hook for the rest. Who all is responsible for the missing money has yet to be determined. Some people have pointed fingers at the association’s late former president and treasurer Art Politano, who died in May. Part-time resident Marie Warshofsky, an association member of 39 years, says more than one person should have seen signs that something was awry. “At least some point in the past, Art Politano was listed as both president and treasurer. If two officers need to sign the checks, it should be two different people. Lisciandrello, who had not served on the board previously, was appointed treasurer after Politano’s death. The Zavada audit began shortly thereafter. Some of the association’s other representatives have distanced themselves since that time. Acting President Fran Orth, who had served as vice president under Politano, resigned during a Dec. 28 board meeting. Orth at that time admitted to not paying association fees for years, according to multiple homeowners at the meeting. She told them it was because Politano never sent her a bill, but said she would reimburse the association for those years. Attorney Eric Hamill, the association’s former legal counsel, has become a distant figure also. Prior to Farley, Hamill had represented the association in court for at least eight years. Lawsuits have been a common occurrence for homeowners living in any one of the four communities that surround Walker Lake. Those developments are Walker Lakeshores, Pennsylvania Lakeshores, Hinkel Estates and Maple Park. Walker Lakeshores Landowners Association charges an assessment fee for costs associated with lake maintenance. That fee is charged to residents of all four communities, even though not all homeowners are required by deed to become association members. When residents don’t pay, a lawsuit usually follows. The association has filed exactly 100 lawsuits in Pike County district courts since 2010, all represented by Hamill. Older records were not immediately available at the time of this story. 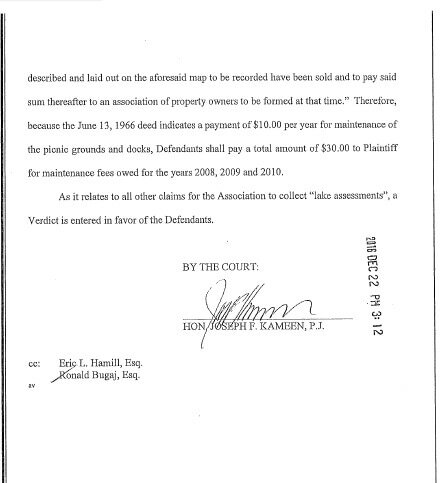 Some of the homeowners sued by the association were Hamill’s neighbors. The lawyer since 2013 has owned four lots in Maple Park, according to Pike County tax records. One of those neighbors is Amelia Pearn, who owns a house with her husband in Maple Park. Pearn, who is not an association member, endured an eight-year legal battle after the association sued her in October 2010 for not paying lake assessment fees. That case cost Pearn $12,200 in legal fees as of July, she said. Daniel Dai was another Maple Park defendant. He too was sued by the association, in 2005, for failing to pay the fees. Pearn and Dai both attended the Dec. 28 association board meeting, where they learned where some of their neighbors’ money — and theirs — had gone. The Zavada audit by that time had uncovered at least $123,492.50 missing in total since 2012, according to Pearn and Dai. Their notes from the meeting were consistent with those of an association member who also attended, but did not wish to be named in this story. Politano was named by Farley as a possible suspect, both Pearn and Dai said. Farley did not return calls to confirm that information for this story. State Police were notified that Zavada’s audit had been completed by the end of 2017, Corporal Smith said. He could not comment further on the details of the investigation. 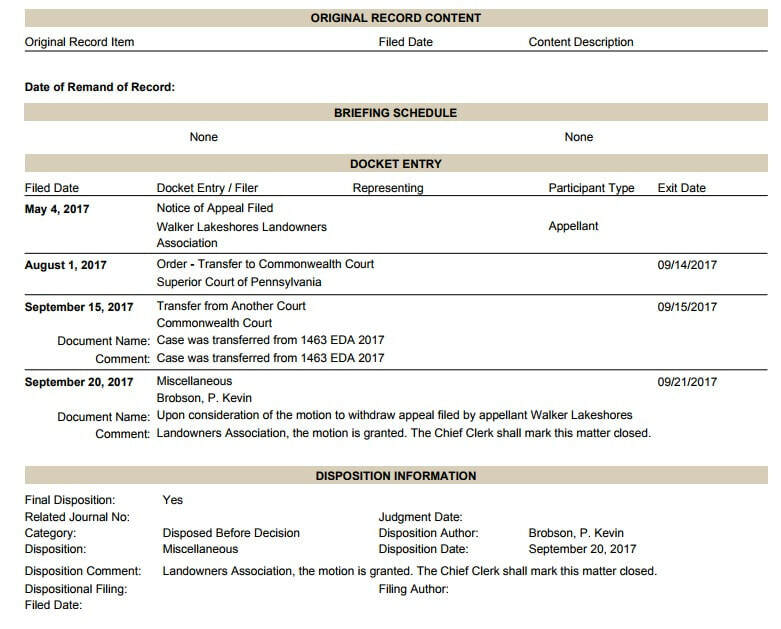 September 22, 2017 - The Commonwealth Court closed out the docket. Walker Lakeshores pulled the appeal that Fran Orth and Eric Hamill championed after Art's death. It is repugnant that Fran Orth, who had to resign as president because she wasn't paying her own dues and had incurred a roughly $50,000 debt with her 'social events', tried to appeal my case to the Superior Court of Pennsylvania when I NEVER OWED more than $10. It makes me wonder if this entire lawsuit against me was just an extension of the presumed criminal activity that was going on over there. The file below is the detailed explanation of the decision above. The file below is the covenants referred to in the decision. Each Maple Park property has a version of this in their chain of title. It is possible that some may vary slightly ($5 for beach maintenance, $5 for boat storage at beach, etc.) but this is generally the version found. And then here is a snippet from a July 2017 response to an appeal by one of the Judges in our case. Hmm.... what they told the paper and what they testified to a month or so prior appear to be a bit different. To read my whole story in order you should start back in 1911 on the Walker Lake page. My property is in a development known as Maple Park in Shohola PA, and has never been in any HOA. The deeds support that I'm not in any HOA. Even the judges rule that I'm not in any HOA. Apparently, the only people that think I am in this home owners association is the home owners association themselves. We are very grateful for all the people that took the time to sign the petition. ​The many many comments of support have been wonderful to read. Here are just a few of our favorites. I am a former owner of 542 Twin Lakes Rd inside Maple Park. My deed was under Maple Park and it never made sense to me why I was paying fees to Walker Lakeshores Landowners Association. I never had a good explanation why this was taking place and was planning on fighting it. I was warned by a local who was familiar with the situation that the legal repercussions were going to be brutal. I never wanted to be in the HOA due to restrictive by-laws it posed on its members. I planned to do major renovations on my property and did not want to ask permission from the HOA. I felt, when the HOA pays my school/property taxes, then they can tell what I can do on my property. I spoke directly with the HOA leadership that I would cooperate in the fees if left alone. There was no promises made by the HOA, but I left with an understanding. After reading these articles and watching the videos, I wish I would have joined the fight against the HOA because there isn't any legal footing to charge Maple Park residents HOA fees. Walker Lakeshores Landowners Association owes Maple Park residents the money it illegally collected that has been charged over the years, not to mention an apology. This woman's story is a travesty of justice and I feel for her and her families situation. No one should have to be intimidated by constant legal action from an organization with deep pockets. It's a sin to take advantage of people. This is nothing short of a scam. ​This is modern day robbery! I can not stand someone/some entity who extorts another person. This has got to stop! I believe the Pearns and I am extremely disgusted that anyone would have to live this way. What a complete abuse of power and waste of the courts time. I live in the area and find this horrible. This is simply Wrong ! HOA's need to be held accountable for this wrong doing. ​This woman is constantly being harassed, even after judge rules in her favor. This ridiculous board must stop! 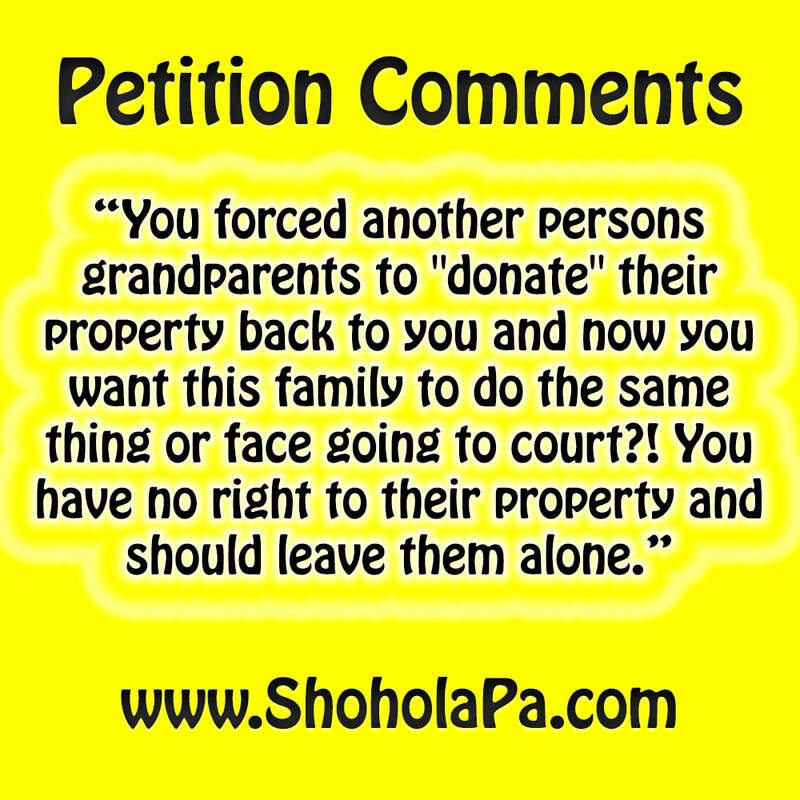 You forced another persons grandparents to "donate" their property back to you and now you want this family to do the same thing or face going to court?! You have no right to their property and should leave them alone. ​I think this is an un-justice. How can someone pay into an HOA when there property doesn't lie withing the HOA nor is it listed as being in such? 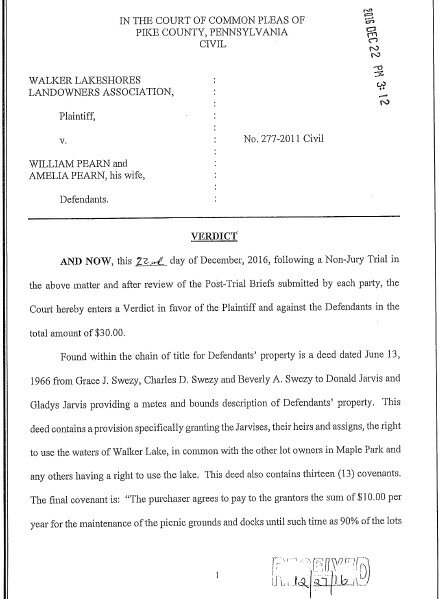 Every court has ruled with the property owner and now they are appealing to the State Supreme court over $30 dollars? Are you kidding me? The lawyers will make out more as they always win over everything else. This is a Frivilous Lawsuit that doesn't get aimed at everyone and is baseless and should NOT continue.